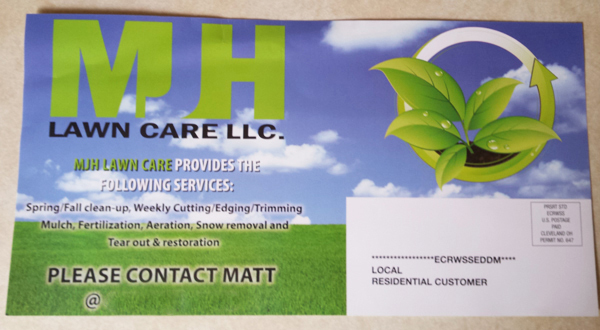 A few days ago I received an Every Door Direct Mail (EDDM) postcard from a local lawn care company offering their services. 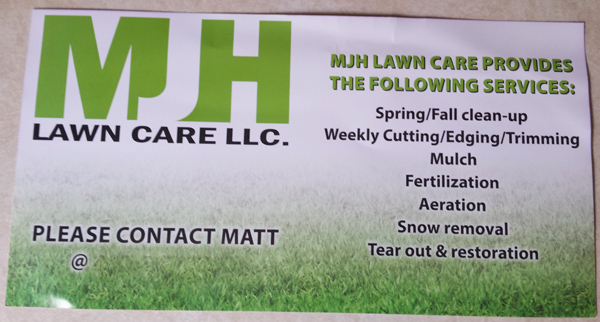 Now, it doesn’t matter if you’re in the lawn care business, real estate, loan officer, retail, dentist, HVAC, Automotive, etc… you want to pay attention to this critique on this lawn care EDDM postcard. It’s going to be good! Before I show you the postcard I want to share with you the first three of ten No B.S. Marketing Rules by Dan Kennedy (Author of the No B.S. Direct Marketing book). I want you to refer to these rules when looking at this postcard. Rule 1: There will always be an offer or offers. Rule 2: There will be a reason to respond right now. Rule 3: There will be clear instructions on how to respond. You can’t tell, but this postcard was printed on 6″ x 11.5″ glossy semi glossy paper. Oversized postcard for USPS’s Every Door Direct Mail (Current pricing is 17.5 cents, but that’s going up at the end of may… still dirt cheap to mail postcards). As you can tell, there’s absolutely no offer anywhere on this postcard. Nothing. Nada. Zip. When creating your marketing you always want to have an offer! It gives prospects a reason to respond. One offer I would make, which I learned from a window cleaning guy (oh, and that’s another thing… don’t always do what everyone else in your niche is doing. Look around at other types of businesses and see how you can incorporate their marketing into your business), would be for a FREE cut. Yes, offer a FREE cut. And, I’d sweeten the deal by not having any other conditions. Just a free cut for trying out their service. Then, after you give a free cut, have the homeowner check out the lawn and ask them what they think. Once they say you did a fantastic job, it’s time to sell them on a weekly lawn cutting service. Bam! That’s your in, and that’s where you’ll make all your money. Also, I would limit this to the first 10 respondents (Gives a reason to respond RIGHT NOW). Some people may not want to call on the phone. They feel they’ll be “sold” and no one wants to be sold. So, I would add another way to respond. I’d say to visit a certain website (where the offer is) or use an email address. Notice the services provided. See “fall clean-up” and “Snow removal?” Well, it’s spring and people aren’t thinking about fall, nor are they thinking about snow removal. I’d get those removed and only concentrate on what the prospects are thinking about. Once you get them as clients, then you can mention other services you provide. Did you catch that? The exact same information is on both sides. Nothing changed except the background image and the layout. That’s it. This would be a great time to add some testimonials, a headline (mentioning the free cut), and a guarantee. You have to be sure you grab the prospects attention! There are other small details I would change, but the above are the most important. It’ll give prospects reassurance that they are calling the right company and didn’t dial the wrong number. So, I want to ask you, what would you do differently if you designed this postcard? What kind of offer(s) would you make? Oh, and speaking of offers… You can claim a copy of Dan Kennedy’s No B.S. Direct Marketing book now for only $4.95, and you’ll also have a chance to get a FREE Marketing Kit and 2 months FREE of the GKIC Gold Membership (total package valued at $633.91). Click Here now to claim the No B.S. Direct Marketing book and your FREE money-making Marketing Kit and 2 months FREE of the GKIC Gold Membership! I agree DAvid. All 3 key components are missing. Not sure where is this business but the actual look can be tie in to either his target market ( family, single adults, empty nesters) and portray that on the picture. Also, there was not a lotta “trigger/attention grabber to it” unless te grass had a touchy feel to it. It was just a plain old postcard. No touchy feel to it. You’re right, he could have tied it into his target market, but he didn’t. The only way I see getting a response with this postcard is if he was mailing tens of thousands of these and just by shear luck get a client. This is why it’s so important for all of us to always use Direct-Response type marketing.